Air Video HD is the ultimate streaming video player for all videos stored on your computer. If want to watch them on iPhone, iPad, iPod touch and Apple TV, this is the app for you. Download and install the server software on your Mac or PC (Linux coming soon) and you’ll be watching your videos on your device in seconds. Going somewhere without network access? Download is just one tap away. Don’t worry about video formats, codecs and bitrates, let Air Video HD handle the dirty details for you. If needed, Air Video HD will transparently transcode the video (“on fly”) so that it plays on all supported iOS devices, including Apple TV (with surround sound and soft subtitles). But we took special care to ensure that transcoding is only done when necessary. No matter what format the video is in, AVI, DivX, MKV and other videos just work. * State of the art playback pipeline. We take our transcoding seriously. Support for soft subtitles, H.264 passthrough for your HD videos and surround sound on Apple TV will let you enjoy your media the way it is supposed to be. * Video Download. Going somewhere without internet access? 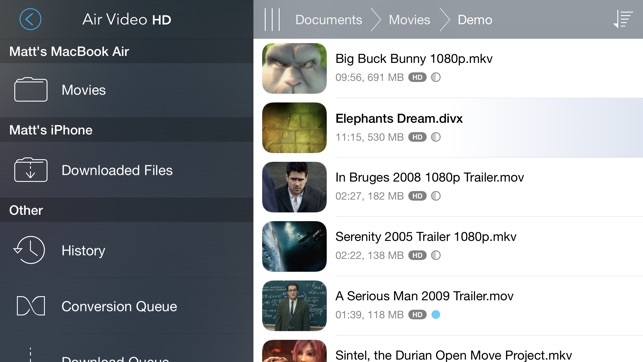 Air Video HD is the easiest way to get your videos to device. Simply browse to your video and press download. That's it. 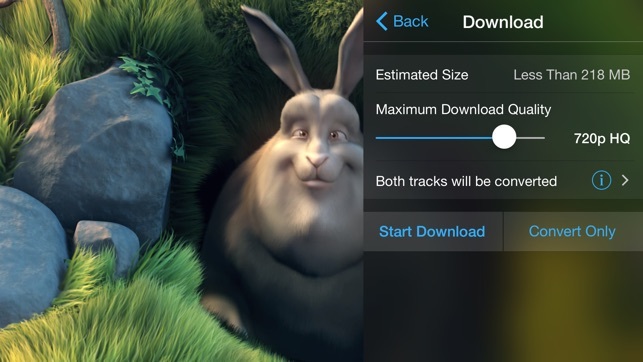 With one slider you decide if you want to prioritize video quality or save space on device. * Synchronized settings. You can stop video on you iPhone and resume on your iPad. Playback settings (including subtitle and audio selection), history and many other are synchronized as well. * History. Quickly navigate between previously visited folders and played files. See which videos have already been played and which are new. Did we mention that history can be synchronized across all your devices? * Audio and Subtitle synchronization adjustment (2.0). Your subtitles being out-of-sync is no longer a problem, you can correct it in just few taps. * Video playback speed control (2.0). In a hurry? Speed it up! * Aspect ratio control (2.0). Now you can finally correct those those weird looking videos. Also works when playing Apple TV of course! 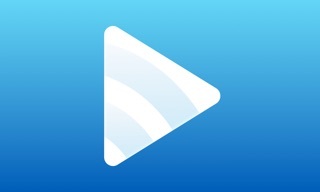 Note that Air Video HD will not play DRM protected videos. All video content purchased through iTunes includes DRM. Video podcast content is free and does not include DRM protection. 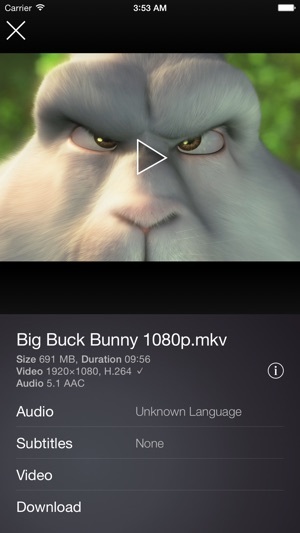 The free server software (available for OS X 10.6 Snow Leopard and Microsoft Windows) is needed to stream and convert the videos and can be downloaded at http://airvideoapp.com . Отличное приложение. Пользуюсь постоянно уже много лет. Очень быстро настаивается, соединяется с компом и отлично и без задержек проигрывает на iPad и iPhone. Использую на довольном старом iPad Mini 2, и тем не менее все работает отлично. Тем, у кого проблемы с воспроизведением видео, скорее всего проблемы с роутером (нестабильный интернет) или старое устройство с перегруженной оперативной памятью. К качеству самого приложения вопросов вообще нет. Рекомендую смело! I like it. It has all features to just see videos from pc. Постоянно зависает и вылетает. Исправьте!! !